Yesterday she started pulling up on her exercauser and now that is her favorite thing to do. She looks so big standing up! Today after her morning nap - we tried eating actual solid food for the first time. We have had baby food and "snacks" like yogurt melts and puffs but we are going to start trying to transition into some solid foods. 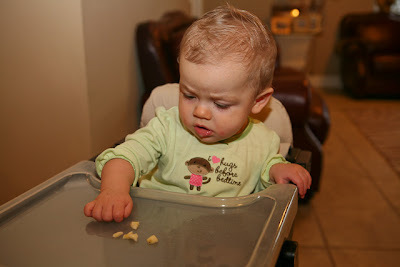 Harper does well picking up food and eating it and the girl does have 6 teeth now. ha! So I cut her up a banana and she REALLY liked it! My baby is turning into a big girl! I'm trying to figure out foods she can eat. I'm always so nervous about what I can give her but I've been checking out www.wholesomebabyfood.com and trying to use that as a guide. I can't believe in a few more months - we will be totally on table food. Where does the time go? I'm so excited because my parents are coming today and we are all going to see AVALON and SELAH at my church tonight in concert! I know it is going to be SOOOO good. I love both of them so much! It will be a great time of worship. And I'm going to finally get to meet a certain blog friend - can you guess who??? I should have a picture tomorrow! Can't wait! I cannot believe how quickly your sweet little girl is growing! I was sorting through Jackson's clothes today in preparation for our next little boy (due in four more months) and a flood of memories came raining down with each precious outfit I picked up. I sat there with tears running down my face, thinking, has a year and a half really flown by already??? Before you know it, you will be doing the same thing... (Harper needs a playmate!!!). She is so precious! Thanks for the website too! Are you meeting Angie?! How fun! I use that website all the time for my 7 month old boy- I make all his foods, its great! have a great time at the concert. i'm so excited that you finally get the meet ANGIE! i love your sweet harper and feel like i should shed a tear for you as we've all watched her grow up. i can only imagine how we'll all feel as she's getting ready for her first date or the prom! :) you're little princess has a following much larger than you know! Yeah! I was hoping you'd get to go to the concert! Meeting Miss Angie has to be the icing on the cake. Have an awesome time praising God tonight with some wonderful ministers of music!! She is growing up too fast. Cannot wait to see her bite into her 1st Doe's Steak:) Yummy! Please give the entire family hugs from Mt. P, TX. What a great concert and it must be Miss Angie! How awesome...have a great time. Harper is such a big girl standing up! She is growing up very fast Mommy. I'm sure Harper has hundreds of cyber Aunties! Have a wonderful time at the concert this evening! It will be a blessing for you & Angie to meet! Have a wonderful time praising & worshiping Him together! Have fun at the concert! I am sure it will be amazing!! So happy you get to meet Angie too!! You girls both rock! I L-O-V-E wholesomebabyfood.com! I have been making my own baby food and that website has been my saving grace! I get all my "recipes" (aka, step by step directions) from there and they also include some other ideas about what foods are good mixed together. I love it! My daughter is about a month and a half younger than Harper, so I get excited when I see you doing new things with Harper, like real bananas, because I know that it is only a few short weeks until I can try it (safely) too! Harper is so CUTE! She looks like such a sweetie! My daughter, Ava, has those same pajamas!! They grow up way too fast don't they! We are on total table foods now. Here are a few of our favorites as long as they are cooked pretty soft: green beans, carrots, asparagus, sweet potato, squash, zuchini. 1/4 piece of toast with butter or some pureed fruit spread on it (trying to use them up). Turkey, chicken or roast beef sliced up. I often use deli meat. Ground beef is a favorite! Blueberries. Velveeta shells. Banana cut up. String cheese cut up. I am sure there are more. I was so scared at first but it is going great and she LOVES her table foods now. There are lots of pics of her eating the on my blog as that is our latest obsession! I have been using that website also. So nervous about 'real' food! Are you meeting Angie?!?! Yay! She only lives a couple hours away from me, but I know a ton of people follow her, so I'm nothing special. lol And yes, Harper is getting big, but still enjoy her little because before you know it she will be 3 1/2!! Have fun and enjoy your family in town!!! Let me guess you get to meet Angie tonight?! That is so exciting! I love her blog, and her story. Have a great time! Harper is getting so big and cuter by the day! LOVE AVALON AND SELAH!!! You are one lucky lady! My family is going to Casting Crowns tonight! Woot! Woot! When it comes to solid food, just jump in! 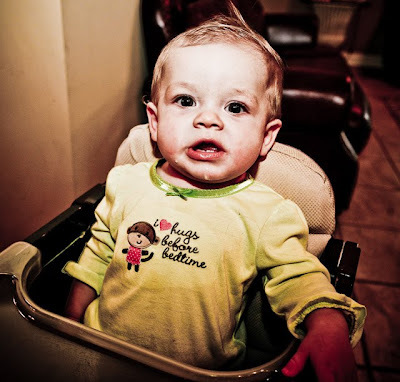 My daughter gave up baby food at 9 months, and she didn't have any teeth. The only thing that was a challenge was meat, but other than that she ate what we ate. Canned fruits are good and just about any vegetable can be cooked soft enough for her to eat. Hope you have a great time tonight! That sounds so exciting seeing Angie!!!! Good job Harper on the pulling up, crawling and solid foods! Way to go!!!! I am so jealous!! Avalon and Selah are 2 of my VERY favorite!! Hope you have a blast and enjoy the time with your parents. I get to spend the weekend with my mom as me and Olivia are going to Texarkana to visit my aunt and uncle. Looking forward to some family time myself!!! She is growing up so fast. It's crazy to see pictures of her standing already. My daughter is 2 weeks older than Harper and she loves bread, strawberries and mandarin oranges. They are all easy for her to pick up and to chew. I love Avalon & Selah...have a great time! I wondered if you were going to go to the concert tonight! I saw that Angie said they were on the bus with Todd so I knew it would be a perfect time for you girls to meet! Have so much fun! That concert should be awesome! How neat the two very Godly women are going to meet for the first time. I know that you will have a great time and I look forward to seeing a picture of the both of you. Harper is precious and she does look so grown up. Ahhh you get to meet Angie! I hope you enjoy the concert! And I love that dress Harper has on so cute! Tofu was one of my kids first finger foods. They loved it and still do. We put it in Miso soup and keep a bunch cut up and in refrig. Try it! My husband and I just saw Avalon and Selah on Saturday night - it was amazing. You are in for a treat! Enjoy yourself. Adorable pics by the way! Have fun at the concert! It will be so awesome. She is so, so CUTE! I love her experessions. She always has that look on her face like "GUESS WHAT?" Congrats on the milestones. They grow up waaaay to fast! Have fun tonight.. I'm super J :) They do grow up so fast and cherish each moment!!! Look how big Harper is getting!! Wow! I must say, it is really nice to be able to give them table food and have them eat WITH you during meal times. I'm a little jelous about Selah and Avalon. I hope you have a great time! Are you meating up with Angie? OMG U GET TO MEET ANGIE?!!!! I'M SOO JEALOUS!!!! I love Selah!! I can't believe how big Harper's growing! Shelby rolled over at daycare today and realized it this time. i missed it and i'm super sad b/c of it and therefore hating my job even more :(...also, i meant to comment, Shelby's Pappy bought her that "Camo Cutie" onesie! LOL... gotta love those AR girls! The time totally does just fly by... and all you can do is savor each day & moment, not trying to live in the past or think too far ahead either! Oh my! She does look so big and oh so sweet! I love that sleepy face picture! :) How fun about going to see SELAH & AVALON! I love them both too! They were some of the 2 cds that I bought after I became a Christian and I just listened and sang their songs all the time! :) What great memories! Tell Angie hey for all of us!! :) Can't wait to see the pics! I'm betting Angie Smith :) Hope you have a great time! have fun at the concert! (and meeting Angie in person!) Have and awesome time!!!!! What fun and how uplifitng the concert will be! I have never seen Selah, but Avalon was AWESOME at the MOPS convention last year! Kelly, Harper is getting to be such a big girl and so darn adorable! I would love it if you would check out my blog today....I think you will like my positive posting today. I would love to see you post your positives, too! Have fun tonight! L*O*V*E sweet Harper eating her bananas...such a fun age! And YES! !...I am thinking you and Angie will have a BLAST!! HUGS! You are meeting Angie! Have a great time! Harper is really growing! Still precious! She is growing up so fast! Mine is 19 months old now, and talking up a storm and running everywhere. Where does the time go? Your little Harper just gets prettier every day! It is always interesting to me to hear people comment on who they think our kiddos look like. I know that you guys think Harper looks like your hubby, which I see at times, but lately I've been seeing some of your Mom peeking out! Kids change so much and it is always fun for me to see the metamorphisis. Hope you guys have a great time tonight! You're going to meet Angie! I'm a little (okay, a lot!) jealous! She's so awesome. Take heaps of pictures! Kelly, I don't know Avalon or Selah. Are they musical groups? Harper is getting so big and so adorable; although, she has always been so adorable. Love the cute pictures of Harper all the time! She really is a doll! Cover those bananas with crushed Cheerios! They are easier to pick up and add a little texture that she'll love! Cheerios, Baby Mum Mums (our all time favorite! They are in the baby food aisle as well if you haven't seen them), cut up Nutri-Grain bars (they also have the organic kind in the baby section), crackers, cut up cheese, shredded cheese. Colten loves ALL of this! It's so much fun to give them new foods and textures! I love wholesomebabyfood.com, too. I probably visit it twice a day! Awe, Harper is so precious! Avalon CHRISTMAS is coming to our town in early Dec. I cannot wait!!! Harper is so sweet and growing!! so jealous. i didn't keep up with selah's concert schedule and checked yesterday only to find out they were in alabama, just 2 short hours from here and I MISSED it! so bummed. can't wait to see a pic of you and angie! the blog world is so crazy! Hang on tight ... it is all a blurr from here on out ... once they get mobile it is over! Your little one is precious and the time does fly! I have three little ones that are 6, 5 and almost 3...I would love to meet Angie! Hope you have a wonderful time! Are you reading Crazy Love? Have fun at the concert! I'm planning to see them on the 23rd... they'll be in my hometown so I'm going home for a visit that week-end! How wonderful!! Both Harper's milestones and your big night. I can't wait to see a pic of you and Angie! You're two beautiful, Godly women that inspire me. Have fun! I'm SOOOOO jealous!!!!!!! I hope you had a WONDERFUL time. Selah has been my favorite for years!!! Oh my gosh she looks so big standing up! That is crazy!! And it sounds like you're going to get to meet Angie!! So jealous! I remember hearing they were going to be in this area and I didn't realize it was tonight. Dang!! YAY! 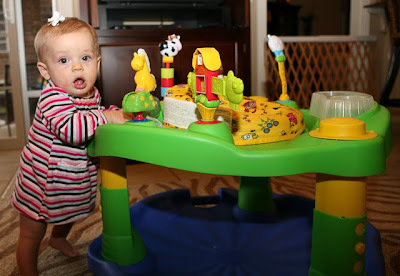 Congrats on crawling more and pulling up! That is awesome! I'm so happy! I know the time just flys by, my little monster will be 10 months old on Saturday. And, I cannot wait to see the picture of you and ANGIE!!!!!!!!!!!!! I've found the more real food cut up I've started my kids on, the better eaters they have been later. Looks like she loves food! Since I am commenter 72 I don't even know if you'll see this, but Harper is just a doll! What a tiny, petite little thing! 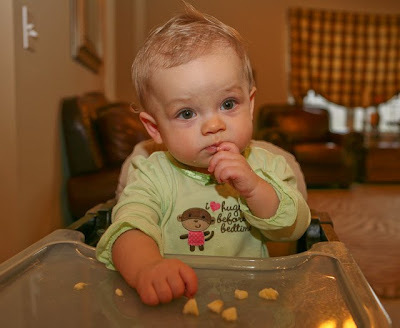 Anyway, what I wanted to tell you was that babies can eat many table foods (soft at first, but gradually firmer) regardless of the number of teeth they have. This will sound totally ridiculous, but I was so worried about my Mary Catherine b/c she had NO TEETH until AFTER she turned ONE!!! The pediatrician said their baby gums are amazing food mashers so even meats such as tiny bits of boiled/roasted chicken can be consumed! P.S. So enjoyed your Gulf Shore posts. We are huge fans of the Orange Beach area and vacation down there every year. Much easier drive from Kansas City than, say, to Florida!!! So glad you'll get to meet Angie!!!! How exciting! I hope I'll be able to meet her some day. Fingers crossed. Love Avalon! Haven't seen in them in so long! Enjoy!! I can't believe Harper is eating a banana! You'll miss the baby, but it will be so easy when she's on table food. How fun to get to meet Angie! And Harper's first concert all in one. Good times! Congratulations to Miss Harper!!! :) Amazing how fast they group up...I know personally I can't believe my niece will be 2 next month...feels like last week when I waited ALL DAY for the phone call that she was finally here (SIL was induced)...so glad Harper enjoyed the concert, too...and though I'm single and can't afford to be picky (I'm not entirely serious...)--I DON'T LIKE BALD MEN EITHER!!!! :) Harper's little green "hugs before bedtime" is just ADORABLE!!! :) Thanks for starting off my morning with her smiles!! Have a great weekend. I love the last two pictures...SO SWEET! Did you get a copy of the book, Caring for your Baby and Young Child from the American Academy of Pediatrics (you can get a free copy if you join the Publix baby club). I was checking it out recently for my 8 month old, and there is a sample menu for their age. It was really helpful for me!